John C. Koch is a writer/director, cinematographer, editor, and photographer working in narrative, documentary, dance film and video design. All of John’s films are independently produced and are self-financed by him and his producing partners. He tells stories on an intimate scale and usually fills the principal creative technical roles himself, with expertise as a cinematographer, editor, writer and director. While this method has distinct challenges, it provides him with the ability to see the whole process at once, to pre-visualize and evolve the work with more efficient spontaneity. In addition to his work as a filmmaker, John has done much work in curating and promoting films. In 2003 he founded and operated Cinema Revolution, an award-winning Minneapolis neighborhood video rental store that specialized in foreign, independent, documentary, classic and cult films on DVD. Out of the video store came Cinema Revolution Society, a curatorial endeavor through which he created the Dance Film Project (2008-2010) and Minneapolis Project (2010) collaborative film festivals. John is an Apple Certified Pro in Final Cut Pro X. He also teaches filmmaking courses in Directing, Cinematography, Adobe Premiere Pro and Adobe Photoshop. 2018 "The Red Goodnight" (Narrative Feature – Director, DP, Editor, Writer) Official Selection, Montana International Film Festival, Billings, Montana. 2016 "How Far" (Narrative Short – Editor) Directed by Jacqueline and Nicole Real, Official Selection, New York Short Film Festival, New York, NY. 2016 "Winter Solstice" and "Late December" (Narrative Shorts – Director, DP, Editor, Writer) screening at Art House Cinema, Billings, Montana. 2013 "Waiting for Molly" (Narrative Short – Dir. of Photography) short film directed by Jesse Knight, Official Selection, Williamsburg Independent Film Festival, Brooklyn, New York. 2013 "Surface Tension" (Short Dance Film – Director, DP, Editor, Writer) (Co-created by Victoria Murphy and Angela Patrinos). Curated online commission, Dances Made to Order. 2012 “throne/thrown” (Short Dance Film – Co-Director, DP, Editor) (Co-directed by Vanessa Voskuil). Cinema screening at Walker Art Center, Minneapolis as part of the National Alliance for Media Arts and Culture (NAMAC) conference. 2011 “throne/thrown” (Short Dance Film – Co-Director, DP, Editor) (Co-directed by Vanessa Voskuil). Official Selection, Moves11, Liverpool, England. 2011 “throne/thrown” (Short Dance Film – Co-Director, DP, Editor)(Co-directed by Vanessa Voskuil). Video installation at Walker Art Center as part of MNTV 2010, Minneapolis. 2010 “throne/thrown” (Short Dance Film – Co-Director, DP, Editor) (Co-directed by Vanessa Voskuil). Broadcast on TPT-2 (PBS affiliate) as part of MNTV 2010. 2010 “Overflow” (Short Dance Film – Co-Director, DP, Editor) (Co-directed by Vanessa Voskuil) and “Today” (Short Dance Film – Director, DP, Editor, Writer) screenings at Dance Film Project 2010, Southern Theater, Minneapolis. 2010 “Yesterday,” “Today” and “Tomorrow” (Narrative Shorts – Director, DP, Editor, Writer) screenings at Minneapolis Project 2010, Riverview Theater, Minneapolis. 2010 “headcleaner” (Narrative Short – Director, DP, Editor, Writer) screening at Bedlam Theater, Minneapolis, as part of Ricochet Kitchen. 2009 “The Seducer” (Narrative Feature – Director, DP, Editor, Writer screening at Trylon microcinema, Minneapolis, MN. 2009 “The Seducer” (Narrative Feature – Director, DP, Editor, Writer) Official Selection, Minneapolis Underground Film Festival. V. Voskuil, performed at the Southern Theater as part of the Walker Art Center “Momentum” series. S. Nishiuchi, performed at the Southern Theater as part of the Walker Art Center “Momentum” series. 2009 “Je ne sais quoi” (Narrative Feature – Director, Editor, Writer) screening as part of “Revolution Reel” series. 2008 “throne/thrown” (Short Dance Film – Co-director, DP, Editor) (Co-directed by Vanessa Voskuil) screening as part of Cinema Revolution's Dance Film Project. 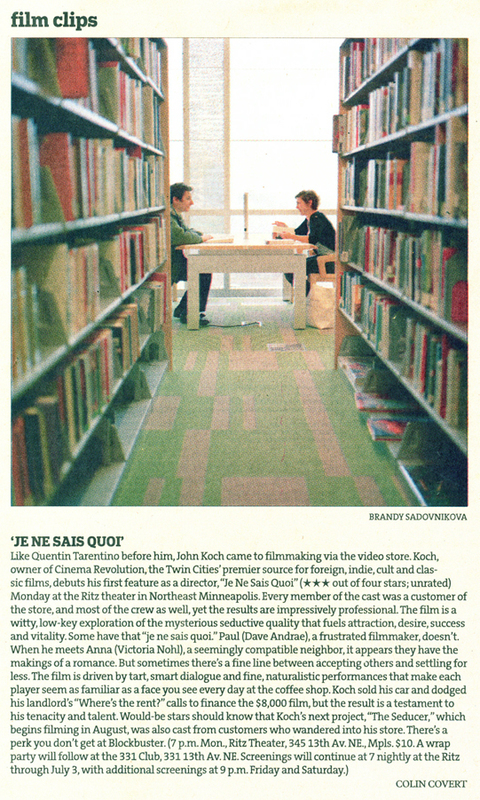 2008 “Je ne sais quoi” (Narrative Feature – Director, Editor, Writer) screening at Minneapolis Underground Film Festival. 2008 “Je ne sais quoi” (Narrative Feature – Director, Editor, Writer) Two-week run of screenings at the Ritz Theater, Minneapolis, MN. 2008 “Rite of Spring” (Video Design for Performance) collaboration with Live Action Set, performances at the Ritz Theater, Minneapolis, MN. 2007 “Your Dynamic Eyes Have Attracted a Secret Admirer” (Narrative Short – Director, DP, Editor, Writer) screening at Varsity Theater, Minneapolis, MN.